AAEON’s Up Board has given us some affordable Intel development boards over the years with products such as the Cherry Trail based UP Board, or Apollo Lake powered UP Squared board among others, that are competitively priced against equivalent Arm development boards. The company has now launched a new UP AI Edge family, which will include hardware based on Intel Altera FPGA or Intel Movidius VPU (Vision Processing Unit). Their first product is based on the latter, more exactly Movidius 2 2450 VPU, and instead of being a standalone board, UP AI Core is a mini PCIe card that can fit into any 64-bit Intel board or computer. The card supports TensorFlow and Caffe frameworks for now. It looks similar in function to Movidius Neural Compute stick, but instead of an USB 3.0 interface, a mini PCIe is used. Since the stick works with Raspberry Pi 3 board, it’s quite possible the AI Core also work on Arm boards with an mPCIe slot. 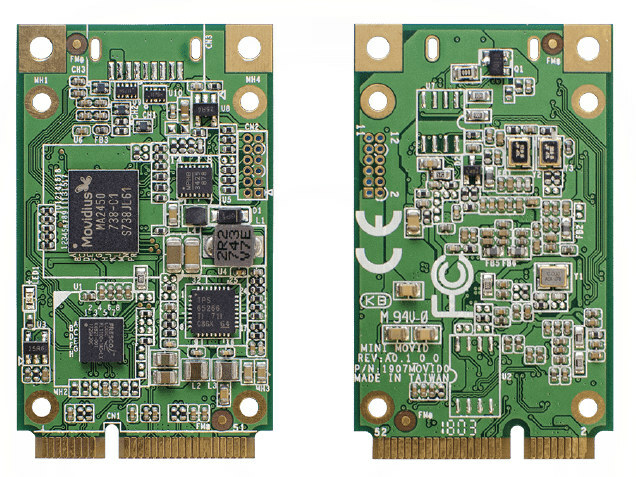 While the company does not explicit mentions the interfaces used over the mPCIe connector, the card is compatible with UP Squared board, so data is likely going over PCIe instead of just USB. The company explains the the board enables enables rapid prototyping, validation and field deployment of Deep Neural Network (DNN) inference applications at the edge without a connection to the cloud. Intel Movidius Neural Compute SDK allows developers to profile, tune, and deploy Convolutional Neural Network (CNN). AAEON is taking pre-order for UP AI Core for $69.99 with shipping scheduled for the end of April.